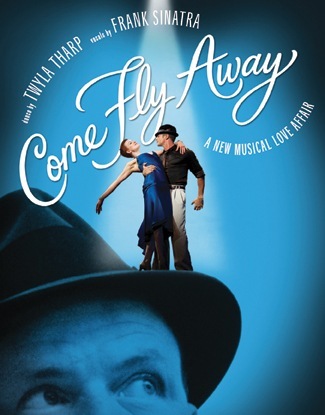 Written and directed by Twyla Tharp, romance takes literal flight in a picturesque party that lights up the cast and band in Broadway’s Come Fly Away at The Marquis Theater. In this tribute to Frank Sinatra, Tharp reigns queen of the classical lifts; within the first ten minutes of the show, she pulls out no less than fifty from her bottomless arsenal! A show tailor-made for all of the Sinatra lovers out there, this production includes a whopping thirty-five songs booming through the theater in which Tharp illuminates a time when people truly knew how to dance and “getting the girl” was all that mattered. Sinatra, like a voice from heaven, plays on a recorded track and is accompanied by 16 live musicians and a charming songstress, Dee Daniels, who lends her sultry vocals for support. So delightful… and what a cast… Every dancer is snatched! ….lines and legs to die for and the most impeccable technique. With such amazing dancers, the choreography can be nothing short of gorgeous. With such effortless beauty, Tharp’s choreography makes it easy for the audience members to pour over the choreography as they would the pages of a Harlequin romance novel nestled on the beach or to cavalierly peek at its shiny costumes as they would mindlessly flip through its pages. This is largely due to Tharp’s clever yet beautiful sculpting of romantic vignettes that give each cast member a moment to shine and every audience member’s heart a chance to beat a little faster when they recognize the crux of heartache or endearment rather than unearthing one-epic storyline. The most well-crafted piece in Come Fly Away is a duet to a Sinatra classic fave, “You Make Me Feel So Young.” Featuring Charlie Neshya-Hodges as an earnest barman and Laura Mead as a bashful baby-faced ingénue in a flirty pink skirt, they tumble across the stage with glee. Neshya-Hodges endless reaching for Mead plays on the notion of the “one who got away.” Tharp’s use of his acrobatic prowess yields audience guffaws as she sends him tumbling through pratfalls for a mere handhold from Mead. Their chemistry builds around this “cat and mouse chase” oozing pure fun. Love it! Holly Farmer’s duet proves to be the most brilliantly performed as she saunters across the stage in a captivating blue dress to “I’ve Got a Crush on You.” Her leg has a fierce 180 that can strike out of nowhere standing straight up! Seductive as Jessica Rabbit, she flits between two men wielding her leginess as currency for their heartbreak. The one piece that shows Tharp very much in her element, interesting enough, is the shoeless, non-Sinatra, classic jazz number to the music Take 5. There are some wonderfully seamless combinations of neo-classical ballet and contemporary SYTYCD type moments that will keep all the concert dance lovers thoroughly intrigued. Well done. Karine Plantadit is hot. Her unabashed command of the stage is deliciously divine every moment she graces it. Whether grinding her clothes between her teeth or floating about the stage with her gleaming Tina Turner-like legs, she is no less than a force to be reckoned. As thrilling Ms. Plantadit is, however, the most heart stopping moment with her is when her partner, John Selya struggles to thrust his arms into his own coat sleeves. As we watch him feel for the arm holes, a look of pure panic, a look of sure fear, no worse, a look of Armageddon succumbs over his face. Why? Because blazing from stage right, in one literal leap of faith (staged to happen supposedly after Selya “casually” puts on his coat), is Karine Plantadit tossed from one male cast member into the arms (..er the hopeful arms) of Selya. OMG!… Still struggling like a villain with his coat sleeves, Selya catches Plantadit -just in the nick of time! Ahhh, this is the stuff that makes great stage door memories… nothing like live theatre folks! Now I know why the panic… Let’s take a poll, shall we? What’s worse… the wrath of God or not catching Plantadit? These dancers have taken their technique classes, have spent their sweat, and now get to have fun in a show that is all dance and all love. Come out and grab your passport for Tharp’s Come Fly Away so you can escape and have some fun too! Doctors Without Borders January 18 – April 1.